PANMUNJOM/SEOUL, Oct. 26 (Joint Press Corps-Yonhap) — The two Koreas agreed to withdraw 11 border guard posts each by November and verify their removal the following month during general-grade military talks at the truce village of Panmunjom on Friday. They also agreed to form a joint team consisting of 10 government, military and civilian staffers from each side to conduct research on the Han River estuary as a preliminary step to ensure civilian vessels’ safe navigation through the waterway where access has been restricted due to cross-border tensions. In addition, they decided on the “early” establishment of a joint military committee tasked with enforcing their Sept. 19 military agreement aimed at reducing border tensions and preventing accidental clashes. The two sides released a press statement entailing their agreements during the latest round of their military talks. The talks were held to check progress in the implementation of the military agreement signed by the two Koreas’ defense ministers after the third summit between President Moon Jae-in and his North Korean counterpart, Kim Jong-un, in Pyongyang last month. The withdrawal of guard posts (GPs) in the Demilitarized Zone “on a trial basis” is a key part of the efforts to turn the buffer zone into a “peace zone” in line with the April inter-Korean summit declaration at Panmunjom. “The South and North will withdraw GP personnel and equipment, take other steps for their complete destruction by the end of November and complete all related steps by the end of this year through mutual verification at some point in December,” the statement reads. “(They) also agreed to hold working-level consultations over the withdrawal of all remaining guard posts based on the evaluation of the test withdrawal,” it added. The two sides reaffirmed their plan to enforce part of the military agreement to halt all hostile acts against each other on land, sea and air from Nov. 1 and apply new procedures for military operations. 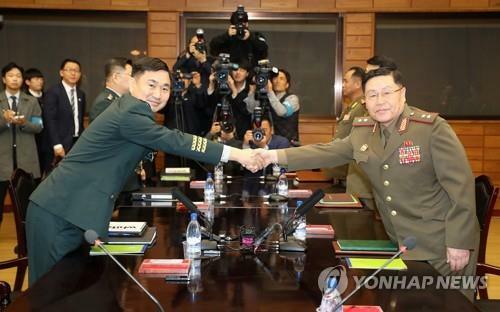 They, moreover, agreed to make “thorough” preparations to ensure that their joint project to excavate Korean War remains inside the Demilitarized Zone can start in April next year as planned. “The South and North agreed to make active efforts to implement the military agreement to enforce the historic Panmunjom declaration, and to this end, agreed to have close consultations through military talks and exchanges of documents,” the statement reads. At the talks, Major Gen. Kim Do-gyun led the South’s delegation, while the North was represented by Lt. Gen. An Ik-san. From the beginning of the talks, the mood appeared positive. “I feel happy to see with my eyes that steps for the disarmament of the Joint Security Area (JSA) have practically proceeded as I saw the marked change compared with the DMZ I saw the last time I came here,” Kim said in his opening remarks. An also expressed his “sense of pride,” noting that the Koreas’ militaries have contributed to the efforts for peace. “Just until recently, the militaries of the two Koreas had pointed guns against each other at the frontlines of confrontation and conflict,” he said. “But I feel great as the militaries are at the forefront of the efforts to realize our Koreans’ ideology by upholding the wishes of our leaders,” he added.